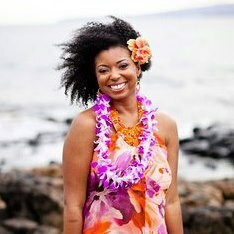 This is the story of an urban city girl who had the Hawaiian wedding of her dreams…. with a few twists and turns along the way. I’m Jocelyn, an events and media producer from Chicago, Illinois who loves life, the arts, movies, traveling, anything fun, and my day job planning a huge yearly festival at an arts college. When I’m not working, you can find me glued to—and often screaming at–the television while watching the NBA, or indulging in So You Think You Can Dance, Shameless and Top Chef marathons. I achieve my ideal state of zen in my condo’s cozy kitchen, whipping up delicious treats for family and friends as they lounge nearby to taste-test. One could say I have never had a problem with work/life balance because I truly “carpe diem” everyday! What I never found was that idyllic balance for myself in a life partner, well that was until I landed at a video production job seven years ago that introduced me to my better, and more calming half, Frederick. I’m the creative social butterfly, and he’s the levelheaded introverted counterpart. As cliché’ as it sounds, the “opposites attract” notion has never been so true. So fast-forward to five years after meeting Fred and somewhere in between two career changes, a kidney transplant and a lovely engagement that was just so “us”, we were in the midst of wedding planning. Going from planning events to planning a wedding is not as seamless a transition as one would think. Each Monday, I will share with you our wedding planning journey and provide you with inspiration and tips for planning a wedding uniquely your own. Stay tuned! *editor's note: we are SO EXCITED to have Jocelyn sharing her experiences with us, and you! Jocelyn is an events and media producer from Chicago, IL. For more information about Jocelyn, visit her at http://www.jdelkadams.com/ or on her Facebook pages at http://www.facebook.com/GrandbabyCakes and http://facebook.com/HighArtCreative.